Imagine being a teenager who is pregnant, homeless, with no support system – kicked out of your home or choosing not to stay in an abusive situation. What would you do? Where would you turn for help? The Annunciation Maternity Home in Georgetown is a welcoming and caring place for desperate young mothers-to-be who want to build a life for themselves and their children. The home is designed to take in homeless pregnant teens as they try to become self-sufficient mothers. Annunciation Home provides a program for teens from 12-17 years of age. Sixteen girls are currently housed at Annunciation Home. These teens can stay through their pregnancies and up to two years post-partum. The program at Annunciation contains several components, which are provided at no cost to the mothers. 1. Education – Each resident must be either in school or working full time. There is a charter school on campus, operated by the University of Texas Charter School system. Girls are also taught life skills, such as budgeting, child care, nutrition, and cooking. The goal is to give them tools to make a living wage, thereby breaking the cycle of poverty and homelessness. 2. Counseling and case management – Case managers ensure that the girls get to medical appointments, work on short- and long-term goals, and generally assist the girls as they move forward with their lives. The girls are given the options of keeping or giving up their babies for adoption, with either choice being presented as a loving one. 3. Meeting basic needs – Transportation, food, and clothing are provided. Child care is also provided while the girls work or finish school. Funding for Annunciation Maternity Home is provided through state agencies (50%) and grants, donations, and special events (50%). While the local Catholic Diocese partially supports the facility, it is not operated by the Catholic Diocese. Religious support is offered to the girls, but they are not required to participate in religious services. Annunciation has about 30 employees who staff the facility 24/7. Our Seeds of Strength $20,000 grant was for a residential assistant to support two different programs and for out-of-pocket personal-care expenses for the girls. Seeds of Strength members Terri Boroczk, Mary Bray, Kathy Herring, and I toured the facility recently. It was apparent to us that Annunciation Maternity Home has been a life-saving bastion of strength for the more than 1200 girls who have passed through its doors. 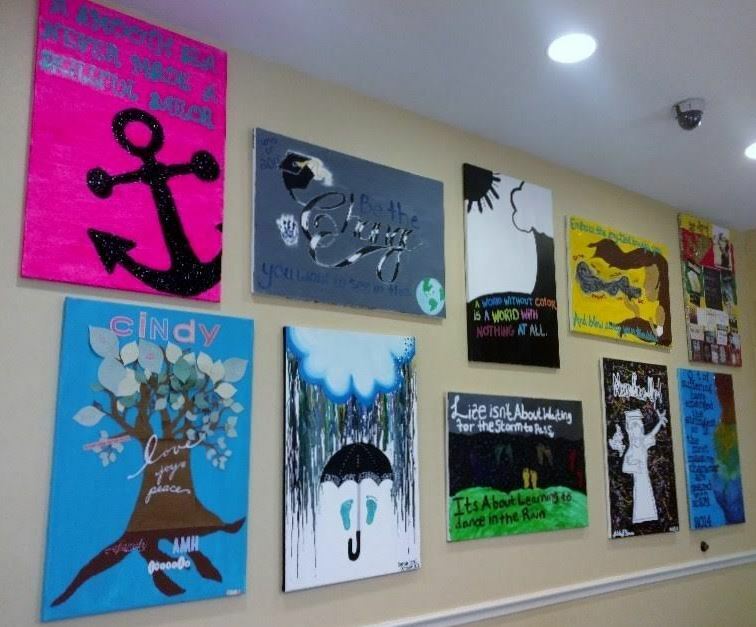 The girls’ art on the walls is a testimony to the strength and resiliency of the mothers who have been fortunate enough to receive help in their greatest time of need. Those pictures speak of structure, discipline, and family, but most of all: LOVE.